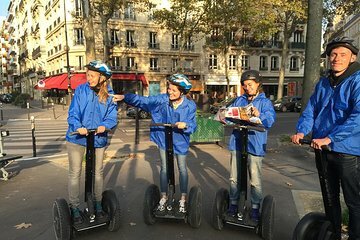 Adicione um toque peculiar ao seu passeio parisiense e junte-se a outros viajantes para um divertido jogo Quest - no Segway! Esta aventura de 2 horas na cidade começa com instruções completas e tempo de prática para se acostumar com o seu Segway. Quando estiver pronto, junte-se ao seu grupo para decifrar pistas e percorrer os marcos da cidade enquanto corre contra o relógio. Com equipes limitadas a cinco participantes e um guia à mão para ajudar quando necessário, você descobrirá um lado totalmente diferente de Paris! Atividade divertida para as famílias! Our family of six- parents and 4 teens- had a great time on this quest. We were ready for a break from museums and walking tours and this was great. We were given several puzzles to solve and then had to reach those locations on our segways with some guidance where needed. Note: someone in the group will need to have access to a mapping program for the best experience. Would definitely recommend and would do again. Fantastic trip, that is well put together and fun, we really really enjoyed it. My only comment is that you really need an internet connection to help solve some of the clues and this should be made clear upfront. The trip was amazing, so many sights covered in the 1,5 hours. Victor made sure we all felt safe on the segways before we took off as a private group and the quest was fun too easy though. The staff is attentive and professional, the length is perfect. This a very good way to discover Paris without the usual blisters on the feet! Highly recommended!